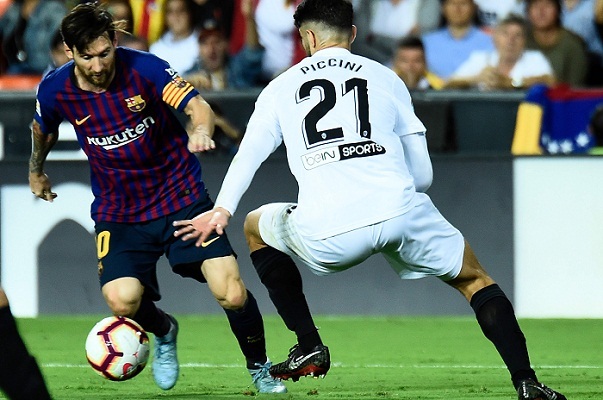 Lionel Messi scored a brilliant equaliser as Barcelona's winless run in LaLiga stretched to four matches following a 1-1 draw at Valencia. Ezequiel Garay capitalised on terrible marking to convert a corner in the second minute, but Valencia were unable to make the most of their early dominance at Mestalla on Sunday. Messi levelled midway through the first half with a wonderful strike from outside the penalty area, although Barca, who beat Tottenham 4-2 in the Champions League in midweek, could not find a winner. Pressure on Ernesto Valverde will grow over the international break, after which Barca will travel to LaLiga's surprise leaders Sevilla, who moved top with a 2-1 win over Celta Vigo. Valencia took led in the second minute, Garay arriving at the back post to tap in after a Dani Parejo corner was inadvertently flicked on by Gerard Pique and Thomas Vermaelen. Michy Batshuayi and Geoffrey Kondogbia both came close to doubling Valencia's lead as Marcelino's men made a fine start, although Goncalo Guedes' injury curbed their potency. Barca levelled in the 23rd minute, Messi drilling home from 25 yards after a one-two with Luis Suarez that involved a nutmeg on the helpless Kondogbia. Kevin Gameiro crashed a shot just wide in the 61st minute as Valencia continued to threaten, then Jose Gaya made a sensational challenge to deny Philippe Coutinho. Messi fired into the side netting and Suarez saw a brace of late penalty appeals rejected, and problems are mounting for Barca and Valverde after missing the chance to reclaim top spot. Barcelona won their first four league games of 2018-19 and looked on track to defend their title, but a run of four matches without a victory - their longest such sequence since April 2016 - has tightened things up at the top of LaLiga. Luckily for Barca, Real Madrid have lost form at the same time, with Atletico Madrid bouncing back from a slow start to sit third. After eight rounds, just two points splits the top six in the league and, while Barca and Madrid will expect to pull away, the league has a refreshing look with Sevilla top. Barca could have easily lost this game and, had Valencia been more clinical, they could have led by two or three in the opening 15 minutes. But Messi - who scored twice in the Wembley win last time out for Barca - hauled his team to a draw with a typically brilliant goal. He could not find a decisive goal this time, but Messi is keeping a stuttering Barca afloat. Valencia have only won once in LaLiga this season and that can partly be chalked up to a failure to convert their chances. Batshuayi has scored once in the league after joining on loan from Chelsea and the striker could have had a hat-trick. The clinical forward who shone for Borussia Dortmund last term was absent. After the international break it's a top-of-the-table clash for Barca as they head to Sevilla on October 20, with Valencia hosting struggling Leganes on the same day.